Based in New York and bred in London, artist Amar Stewart&apos;s practice is an attempt to blend music and city life. 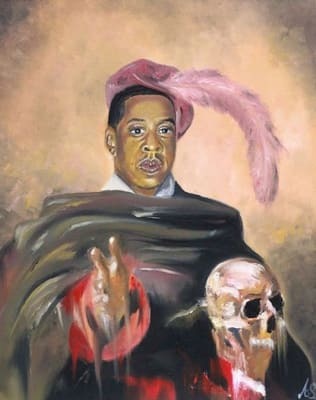 For a series of hilarious portraits, Stewart has imagined rappers as if they were painted by 17th century masters. The result collapses history so Renaissance elite are transposed with today&apos;s biggest names in music. For the series, rappers like Jay Z, Tupac, Biggie, and Rick Ross appear in traditional dress. Many hold skulls, which were considered memento mori during the Renaissance, morbid reminders that life is short. While most of the paintings are portraits, one is an updated still life that mimics a Dutch Old Master painting. Instead of a goblet of wine and rotting fruit, however, Stewart painted a bottle of Hennessy and the Wu-Tang Clan logo. The old days never looked so good.